Who will save the children of Falluja? SATIRICAL song writer Tom Lehrer remarked that when US Secretary of State Henry Kissinger was awarded the Nobel peace prize, satire became obsolete. Since then we've had further occasions to feel cynical about the choice of Nobel candidates. But what can we say about a man whom many regard as a war criminal being honoured by a well-known children's charity? Tony Blair was last night recognised for his humanitarian work at a glamorous gala to raise funds for a global children's charity – in front of guests including Lassie the dog. Upon receiving his award Blair praised aid workers fighting Ebola in West Africa, as well as the increase in the amount of foreign aid donated by the UK over the past 10 years, according to the Mail Online. Well Lassie should have cocked his leg or thrown up his dinner at this point, but he is not available for comment. Tony Blair must know all about brutality, conflict and intrigue, having lied his way into the war on Iraq, as well as presiding over the continuation of policies that increased the gap between rich and poor in this country, and Tory legislation tying trade unions hand and foot from doing much about it. As for self-interest, Tony Blair was not short of a few bob before he became prime minister, and since then he must have lost count of the millions he has amassed from various jobs and sinecures. Save the Children and other charities have portrayed some heartrending scenes of child poverty and suffering at home and abroad to stir the public's conscience. We don't expect aid charities to do anything as controversial as discussing the underlying causes - though some, such as War on Want, do remind us that policies have consequences. But even at the level of just showing us how bad things are, before Save the Children goes all gooey fawning on Tony Blair it could focus its attention on just one Iraqi town, Falluja, attacked and bombed twice by US forces with British participation. At first they denied the use of white phosphorus, supposed to be banned under international law, and depleted uranium munitions. But these things came out. And whatever the precise causes, the effects of war on Falluja have continued. 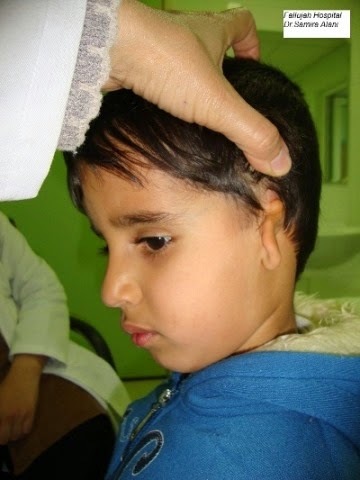 "Iraqi physicians have also long reported a spike in cases involving severe birth defects in Fallujah since 2004. They have reported children born with multiple heads, serious brain damage, missing limbs and with extra fingers and toes." The BBC's John Simpson reports from the central Iraq city of Falluja, where ... in Falluja had warned women that they should not have children. But what was the reason for Save the Children honouring Blair anyway? Was it supposed to attract more money? Blair is hardly the most popular figure in Britain today. But then maybe there's a clue in them holding this ceremony in New York, which is also home to JP Morgan Chase, the bank which gave our former Prime Minister a part-time job this year, a mere £2 million to supplement his pension. Though some charities have to be increasingly careful these days to avoid anything "political" which might affect their status, others seem to be drawing closer to government and big business, so that sometimes it becomes harder to see the difference. While still relying on public generosity and unpaid volunteers, they may also serve as conduits for government funds and corporate tax-exempt donations with or without strings attached. While expecting lower-ranking staff to work enthusiastically for low pay or even workfare, they insist that top bosses merit salaries at least comparable to those of major company directors or government ministers. My landlord, a registered charity, finds it necessary to increase our rents each year, while its CEO reportedly earns more than the Prime Minister. During the recent dispute at St,Mungo's where Unite union members fought off attempts to lower grades and do away with consultation, the union was interested to see how this charity's board had been filled with newcomers after a merger with another, less well-known charity; and how these included someone linked to Serco, a commercial outsourcing business keen to acquire new profitable activities even as it has been losing or having to divest from others in which it has not been doing so well. Executives at one of the UK’s most prominent international aid charities were handed bonuses worth more than £160,000 last year. Save the Children increased performance-related pay to executives by a third compared to the previous year, a move that could prove controversial following criticism of the huge pay-packets enjoyed by charity bosses. The charity’s chief executive Justin Forsyth, a former advisor to Tony Blair, was among nine Save the Children executives handed the bonus in 2012. It was revealed earlier this week that Mr Forsyth earned a salary of £163,000, which is now known to include £22,560 in performance-related pay. He is one of six staff at the 14 charities which make up the Disasters Emergency Committee (DEC) that earn more than the Prime Minister’s £142,500 salary. The revelation prompted the International Development Secretary Justine Greening to say that the finances of major aid organisations - which receive hundreds of millions of pounds from taxpayers - must be open to scrutiny. William Shawcross, the chairman of the Charity Commission, also said that ‘disproportionate’ salaries in the face of decreasing charitable donations from the public risked ‘bringing the charitable world into disrepute’. Save the Children paid its executives £120,000 in performance-related pay in 2011 but said that Mr Forsyth declined the money due to being ‘relatively new’ in his role. The payments increased significantly to £162,000 last year after the company ‘restructured’ the way it offered bonuses. The charity said the payments encouraged the ‘very best’ from staff and helped to ‘save the lives of more of the world’s poorest children’.